Known by many names The Teacher Report Card is an activity that can cultivate positive relationships and collate unique data. Some teachers find observations of others, constructive criticism and feedback as a threat. Some doubt the validity of The Teacher Report Card as some students take the opportunity to ‘get back at’ their teacher. Some teachers embrace the process as an opportunity for development. Why ask students to ‘grade’ the Teacher? At our school (like many schools in Queensland, Australia) there is currently a focus on pedagogical and developing performance frameworks. The reflection process which is mandatory during our ‘pre-service’ activities becomes more optional when we are ‘fully’ qualified. In the past five years policies have been implemented to ensure continuous development of teachers as professionals. Full time Teachers are now expected to complete 30 hours of continued professional development activities per year in order to maintain their registration. While some resist this growing culture of reflection, development, observation and improvement, the simple fact is that even teachers need to seek feedback on their work. The concept of feedback is not at all new. 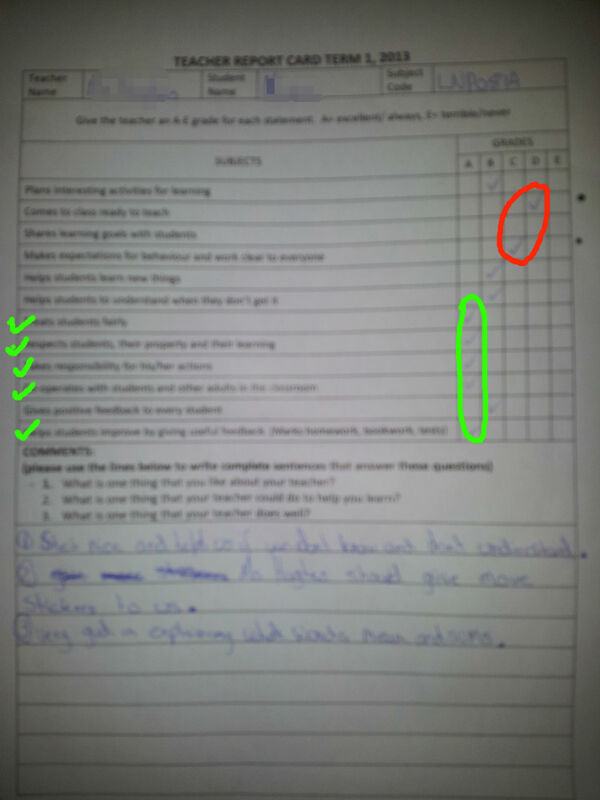 Teachers give feedback to their students (in the form of comments in notebooks, marking rubrics and report cards). Businesses of all sizes seek feedback from their customers and websites/ blogs request feedback with ‘like’ buttons and comments forms. 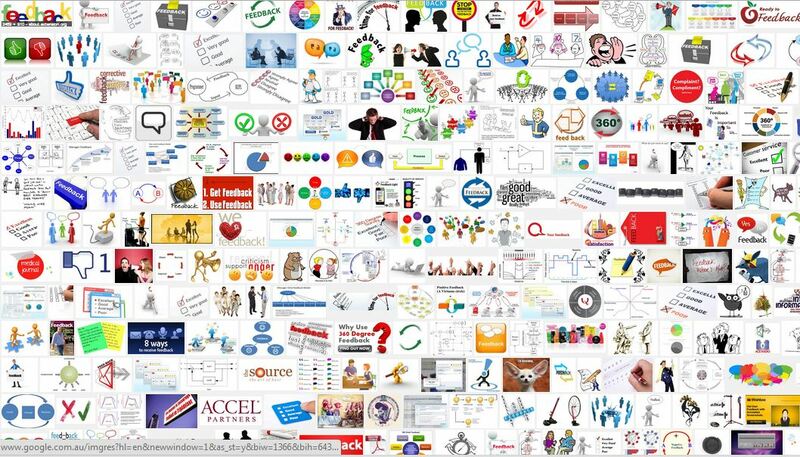 A Google image search returns hundreds of pictures from feedback button icons to flowcharts, slogans, cartoons and more. If teachers are going to be good at what they do, they need to seek feedback too. It is useful to ask respected colleagues to observe lessons, record teaching and reflect as well as collate test scores. All of this provides feedback in various forms and when collated can assist you to improve in several areas of your teaching practice. However, who knows you and your teaching better than your students?! Annette Breaux advocates the use of the Teacher Report Card by all teachers in order to learn more about their teaching practice and ways they can improve. She gives suggestions for questions and formats, insisting that each teacher create their own report card relevant to their teaching context. Mark Miller writes about Student Voice surveys on his blog The Goldfish Bowl. He makes some interesting points about the wording of questions on these surveys as well as the positive and negative outcomes of collecting student feedback. What do you ask students to do? 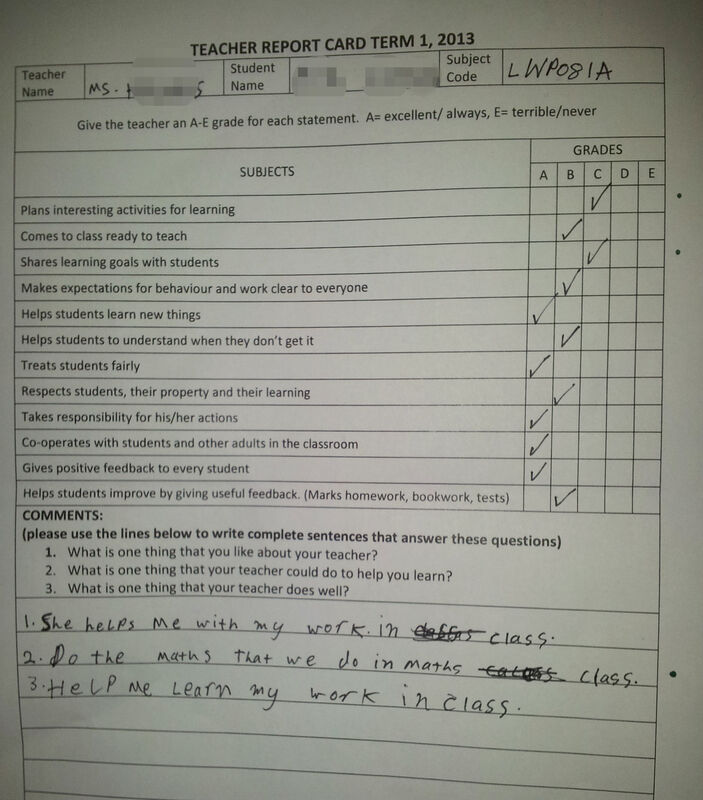 Below you can see examples of student responses to the Teacher Report Card that I constructed for my class. I gave students a list of criteria for a good teacher, using language that was familiar to my students. Our school uses a SWPBS program with the principles of Respect, Responsibility and Co-operation, so I used these words on my Report Card. I also used language/ points from our teaching and learning framework such as ‘learning goals’ and ‘improvement’. The students then ticked a grade from A-E (the same scale used on student reports at our school) for each criteria statement. I then solicited comments from the students by asking three basic questions and requiring the students to answer these in complete sentences. You can see here, examples of two student responses. I am yet to organise the responses properly but I did enjoy reading my ‘reports’ from the students. A few of them were quite entertaining. How to introduce The Teacher Report Card to your students and using the information you have gathered from completed Reports. Click here to check it out. There is something about ‘dancing’ that I need to share this week. But I really enjoyed this video and I need to watch Space Jam again. Kid president knows his stuff, and while I might be coming a little late to that party, I’m going to celebrate the fact that I turned up at all. Maybe it is the theme music or it is a kid in a suit dancing on a football field. But this made me smile and made me think and I don’t often do both at the same time. We all need a little encouragement sometimes. The important thing to remember is your purpose and your effort. Did you have a purpose today? Did you do the very best that you could do today to reach the goal? Today’s best might not be as good as yesterday’s best and might be less than tomorrow’s best. But was it the best you could do today? Then, give yourself a high five and keep on being awesome! This video has become a bit of a legend at my workplace. The term “tipping point” has been used in jest several times. We like to laugh at the silliness of some of these things, but often a lone nut is really a genius. 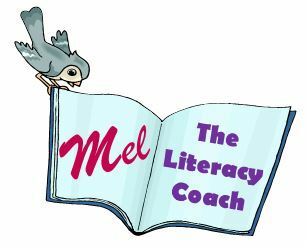 At my school we are beginning to see the fruits of our “shirtless dancer” and his “first followers” there is a movement for change when it comes to literacy and I meet with far less resistance in my role as the Literacy Coach. The interesting thing is, that our Numeracy journey is only just beginning. I am seeing some of the same mistakes happening over again. This is a little frustrating for me, as I wonder why the powers that be are not learning from past mistakes. The Numeracy Leaders at our school have a rare opportunity to look at the Literacy movement and to note the positive and negative actions of the past. If history is going to repeat itself, why shouldn’t we select the events we want to re-live instead of suffering through the painful ones. How far have you travelled along your leadership journey? What would you do again? What would you avoid? Here’s the one, I’m really wondering about… How would you approach another ‘coach’ or ‘leader’ in your school who is only just beginning their journey? What would you tell them? At the beginning of every lesson I teach, the class begins with three routine activities. The first one is Silent Reading. Some classes settle into this very well, others take forever to get the message. It takes a long time and perfect consistency. However, it is worth the time and the effort. Trust me. The students are working on these two activities at the moment. We take a long time to settle, so I get straight into direct teaching after “Today’s Number” but next term I will start to include a word/ writing task as well. These tasks may look like “busy work” to some. Behaviour/ Classroom Management advice will often tell you to set the students up with a simple activity as soon as they enter the room to give you (the teacher) a chance to mark the roll and establish a positive beginning to the lesson. However, this is not the only reason that these tasks are important inclusions in our classroom routine. Not only does it give my students the opportunity to enter the room, settle into a routine task and wake up their brains before having to interact with fellow students or even with me. They are practising important literacy and numeracy skills. They are remembering rules about how to multiply by 10 and they are categorising numbers according to characteristics. Often my students struggle to settle at the beginning of a lesson. Often, they don’t know how to ‘expand’ a number, determine odd/ even, write a large number in words, divide by 10 or halve a number. Often, they know how to do these things, but don’t know that ‘halve it’ means the same as divide by two. The flexibility of language and strategies is important for my students to learn and to rehearse regularly. What do you do to settle your students at the beginning of a lesson? What activities do you use to provide opportunities for revision/ rehearsal of skills? How are these activities seen by other teachers? What happens in your classroom that could be mistaken for ‘busy work’? What is your purpose for this activity? Is the purpose or benefit two-fold (e.g.routine plus practice of skills)? Are there activities/ tasks that you are allowing to take time in your classroom that is merely busywork? What can you do to make this work more purposeful OR what is more important that needs to replace it?